Okay, I haven’t seen the movie, and I doubt that any of you have either, because somebody made the mistake of releasing this independent British kids SF movie in Britain the same weekend as Cinderella and Spongebob. It didn’t have a hope, which is a pity, because the premise is solid, and the story as presented in this novelisation is better than most. 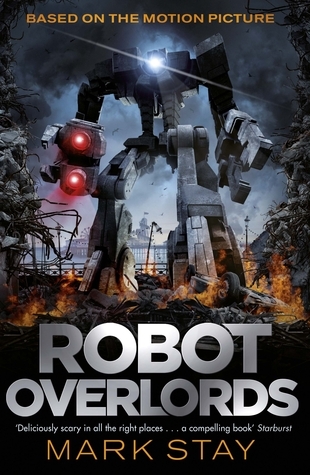 I do think it could have done with a stronger title, especially for the movie – the tag line “Robots Never Lie” might have worked better. The scenario is that the Earth has been invaded by robots intent on subjugating humanity in order to mine people for any useful data they might have. The war was over quickly and now everybody is confined to their homes, aside from the Volunteer Corps, humans who have chosen to cooperate with the robots. Obedience is enforced by means of implants which track people and blow them up if they are caught by the robots breaking their rules. So, how do a bunch of kids get the upper hand in a situation like this? Very carefully… and with two particular strokes of plain unpredictable luck, the first of which gives them a way to disable their implants, and as for the second… That would be giving away a bit too much. Put it this way – I found it rather more believable than the ending of Independence Day. It was a bit British – I couldn’t help wondering how the Robots’ strictures would have worked in other parts of the world. And the primary villain is a Geography teacher turned quisling who felt straight out of Doctor Who. Which was another thing. I kept expecting the TARDIS to suddenly materialise… But enough of that. It’s not great, but it’s a pretty good read, better than you might expect. I’d definitely recommend this story to teenagers, especially if they have an interest in robotics.